Professional athletes are trained to tax their bodies on a daily basis, drawing out effort that most people could never achieve. And the better their performance, the more they stand to earn. But thanks to so-called “jock taxes,” they also stand to give a lot of that money to Uncle Sam. When you take all leagues into account, these taxes add up to major windfalls for often cash-strapped states. Consider California, with its 19 professional sports franchises. For multimillionaire stars, paying more than a dozen tax bills every year might not seem like a big deal. 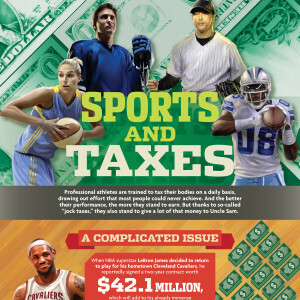 But most members of pro sports teams aren’t paid tens of millions of dollars each year. And depending on the league, some of them don’t make much more than the average American worker. And while star athletes may be raking in millions, not every player on every team in every league is so fortunate.